Several tips and suggestions are given here to help those who feel a little harder to get much damage to get 30k DPS. These tips may not be specific, you can take a glance. 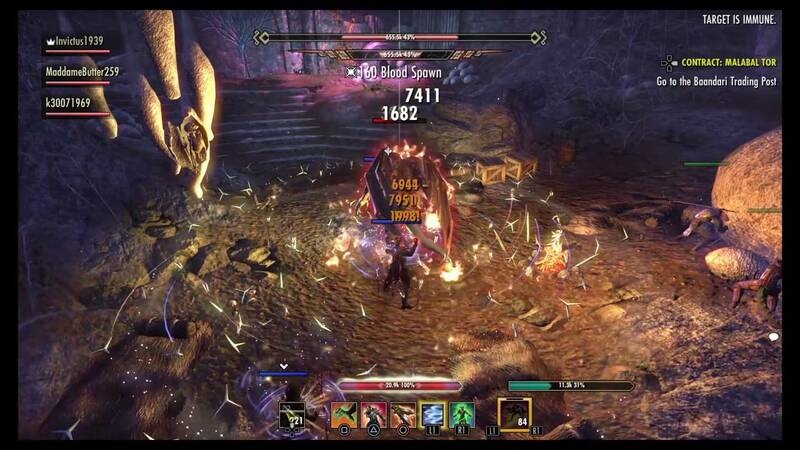 On the premise, you should be able to pull 25K solo and 35K in group setups with buffs, even without vMA weapons. You can get DPS higher With vMA. Below are several tips to help you get higher DPS. 1). VO is better than Agility in dungeons and trials, which will give you some DPS increase as well. But it is harder to get if you don't have a proper guild, as monster set you should be using Kragh / Velidreth / Stormfist / Selene depending on what you like but mostly Kragh is good. 2). Choose wise gear. You could change your gear too: 3VO instead of agility would give you more deeps, and in your weapons, 2xRDM or 2x Lekis for weapon damage would be more optimal. 1 Axe 1 Dagger for dungeons/trials and dual daggers for solo. You probably want to run 5VO for solo though. 3). Keep playing and rotation will come to you naturally. Try to improve your your rotation. By doing so not only will your dps increase it will also become easier for you to play since you will learn to prioritize and apply your skills in the right order. 4). If you're rich enough to run through potions and don't rely on Hunter thingy for Savagery you're gonna pull more DPS as well. For pure single target fights I use Flurry, Rapid, Rearming, Deadly Cloak, Bound and Rend on front bar, while using Hail, Injection, Rearming, Hurricane, Bound and Flawless on the back bar. Backbar Flawless and Rearming is mostly there to add a little bit damage to my bow bar, 11% to be exact. 5). Weaving attacks as fast as possible, etc, it takes some time to get used to rhytm. Do you get the tips? What do you think of? You can have a try and make out the suitable way for your own gameplay. Don't worry about the in-game currency, you can buy cheap eso gold over here. We are well experienced and a safe place to buy.